The Ubiquiti EdgeSwitch targets the Broadband / ISP / Carrier market, which offers an extensive suite of advanced layer-2 switching features and protocols, and also provides layer-3 routing capability. The UniFi switch targets the Enterprise / SMB market, which is designed for a wider IT audience, and therefore, tend to be simpler, and easier to use. Both these two types Ubiquiti switchs are supported for SFP fiber connectivity and widely used among people. However, which SFPs can I use with my EdgeSwitch or UniFi switch? This article may give the answer on ubiquiti SFP compatibility. Which Ubiquiti EdgeSwitch Should I Use? The EdgeSwitch offers the forwarding capacity to simultaneously process traffic on all ports at line rate without any packet loss. 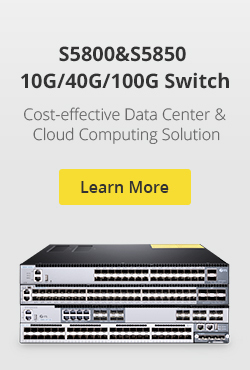 The EdgeSwitch provides total, non-blocking throughput. Among 8-Port model up to 10 Gbps, 16-Port model up to 18 Gbps, 24-Port model up to 26 Gbps and 48-Port model up to 70 Gbps. The following table lists the comparison between EdgeSwitch modules, according to your specific need to choose the right one. EdgeMAX – Which SFPs are compatible with EdgeSwitch? The ubnt edgeswitch provides fiber connectivity options for your growing networks. The 8, 16, and 24-port models include two SFP ports, providing up to 1 Gbps uplinks. For high-capacity uplinks, the 48-port models include two SFP and two SFP+ ports, providing uplinks of up to 10 Gbps. Take the ES‑8‑150W for example, it has 8 Gigabit RJ45 ports and 2 Gigabit SFP ports for 10G applications (shown in the figure below). For SFP ports, we should use SFP modules and fiber patch cable. According to an article titled “Which SFPs are compatible with the EdgeSwitch?”published in Ubiquiti Help Center, the following SFP transceivers are compatible with EdgeSwitch (only listed can be found in Fiberstore here). Which Ubiquiti UniFi Switch Should I Use? The UniFi POE switch offers the forwarding capacity to simultaneously process traffic on all ports at line rate without any packet loss. For its total, non-blocking throughput, the 24port model supports up to 26 Gbps, while the 48-port model supports up to 70 Gbps. The following table lists the comparison between UniFi switch modules, according to your specific need to choose the right one. UniFi – Which SFPs are compatible with UniFi Switch? Each model includes two SFP ports for uplinks of up to 1 Gbps. The 48port model adds two SFP+ ports for high-capacity uplinks of up to 10 Gbps, so you can directly connect to a highperformance storage server or deploy a longdistance uplink to another switch. Take the US- 8- 150W for example, it has 8 Gigabit RJ45 ports and 2 Gigabit SFP ports for 10G applications (shown in the figure below). For SFP ports, we should use SFP modules and fiber patch cable. According to an article titled “Which SFPs can I use with UniFi switch?”published in Ubiquiti Help Center, the following SFP transceivers are compatible with EdgeSwitch. Since among some SFP module types are the same as the EdgeSwitch, I only list the different SFPs here. 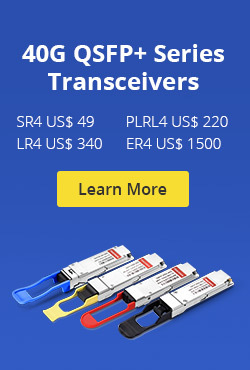 Fiberstore (FS.COM) provides a series of Ubiquiti compatible SFP transceivers that can be used with EdgeSwitch and UniFi switch. 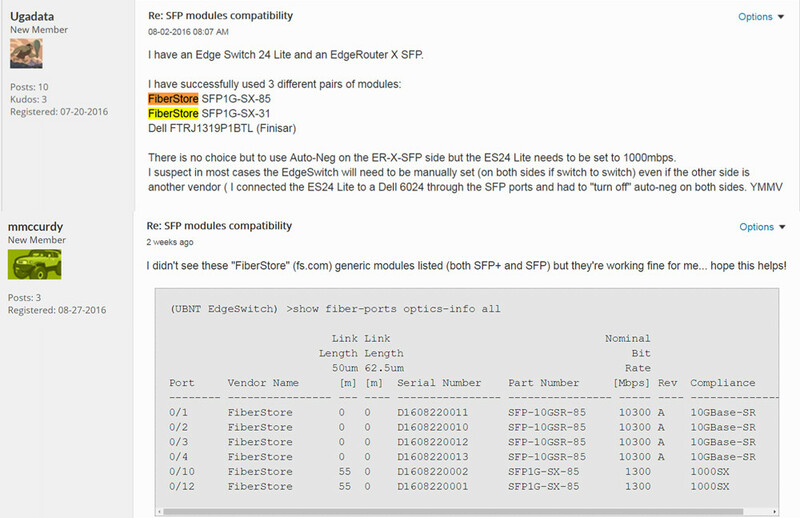 In Ubiquiti Networks Community SFP modules compatibility section, some people tested Fiberstore SFP modules in their EdgeSwitch. As shown in the figure below, SFP1G-SX-85, SFP1G-SX-31 and SFP-10GSR-85 SFPs are working. This entry was posted in Fiber Optic Transceivers, SFP Transceiver, SFP+ Transceiver, Switch & Transceiver and tagged edgeswitch, EdgeSwitch sfp, SFP modules compatibility, ubiquiti compatible sfps, Ubiquiti sfp, ubiquiti sfp port, ubiquiti sfp switch, ubiquiti unifi, ubnt edgeswitch, unifi poe switch, UniFi switch sfp on September 12, 2016 by Alice.Gui.